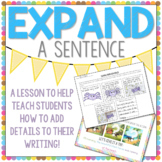 Expand-A-Sentence Activity to Help with Adding Details to Writing! 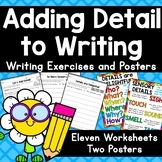 This power point helps students understand what a detail is and how to use them to help their writings. This is also included in My writers workshop mega units part 1,2, and 3. 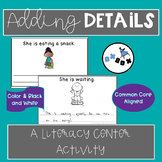 Included Delightful details power point a worksheet to check for understanding. 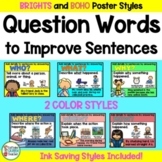 This writing activity was made to complement First Grade Wit and Wisdom Module 1 but can work in any classroom! Students read the sentences and think about how they can improve them. They add details to the sentences (adjectives, verbs, more details, etc.) and record the new and improved sentence! Outline to prepare middle school ELL students for responding to a prompt from the NYSESLAT. 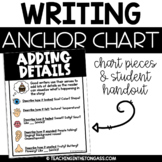 Includes lesson plan and outline. These examples can be used to show your young writers how to improve their stories by adding details to their words and pictures. I use this during conferences with my students, for goal-setting, and in parent conferences to show the next step in their child's writing. 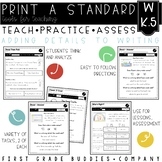 This is a great resource for students to use in grade K-3 who need help with adding details to their writing. It is great to print and laminate. 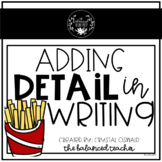 Help your students organize their thoughts for adding detail to a narrative. 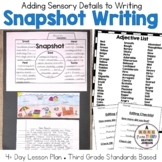 This worksheet acts as a checklist which they can fill in ideas for figurative language, dialogue, action leads, and sound effects.